Rexton, New Brunswick near Elsipogtog First Nation on October 7. Toban Black/flickr. The Anishinaabe people from Aamjiwnaang First Nation are surrounded by heavy industry. For the Anishinaabe people at the southernmost tip of Lake Huron, cedar is not just a tree – it is sacred. Used in medicines and teas, the tree’s roots, bark and sap have been central to their physical, mental and cultural wellbeing for centuries. “We smudge with it, as singers we inhale it, as a medicine we bathe in it,” said Ron Plain, an Anishinaabe tribe member. But the tribe has abandoned its generations-old tradition. The cedar is tainted with cadmium, a metal linked to cancer and learning disabilities. 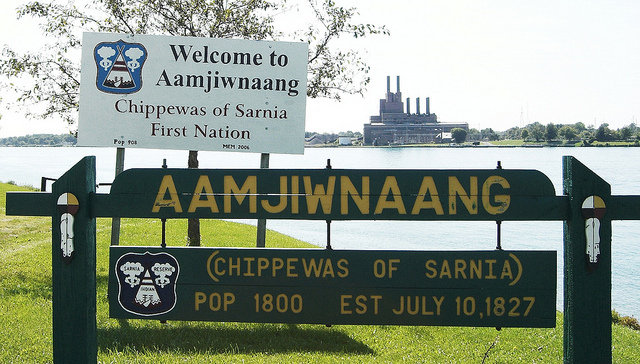 In this region of Ontario, dubbed “Chemical Valley,” the contamination is part of everyday life for the Anishinaabe. For decades, indigenous people in the United States and Canada have been burdened with health problems linked to environmental pollutants. But that isn’t their only sacrifice: Pollution is crippling some tribes’ culture. Their native foods, water, medicines, language and ceremonies, as well as their traditional techniques of farming, hunting and fishing, have been jeopardized by contaminants and development. And as indigenous people lose these vital aspects of their lives, their identity is lost, too. For the Anishinaabe people at the southernmost tip of Lake Huron, cedar is not just a tree – it is sacred. Used in medicines and teas, the tree’s roots, bark and sap have been central to their physical, mental and cultural wellbeing for centuries. “We smudge with it, as singers we inhale it, as a medicine we bathe in it,” said Ron Plain, an Anishinaabe tribe member and environmental policy analyst at the Southern First Nation Secretariat. But the tribe has abandoned its generations-old tradition. The cedar is tainted with cadmium, a metal linked to cancer and learning disabilities. In this region of Ontario, dubbed “Chemical Valley,” the contamination is part of everyday life for the Anishinaabe. For decades, indigenous people in the United States and Canada have been burdened with health problems linked to environmental pollutants. But that isn’t their only sacrifice: Pollution is crippling some tribes’ culture, too. Their native foods, water, medicines, language and ceremonies, as well as their traditional techniques of farming, hunting and fishing, have been jeopardized by contaminants and development. And as indigenous people lose these vital aspects of their lives, their identity is lost, too. “Animals have died off or left, the water is no good. This is not the world that we know and rely on,” said Kathy Sanchez, a member of the Tewa Pueblo, a tribe in New Mexico that is living with a legacy of pollution from uranium mining.